♪ Sammy Jankis will be presenting in Spain A New Life in February 2018. ♪ Songs on the Eve of Dismissal CD, with music by Chris Abelen and text by Bastiaan Geleijnse just released. You can listen to the CD here. ♪ Lor in Pravena, recorded their first improvised EP in NJ in April 2017. To be released in 2018. In June 2016, the title track of Lorena’s “My Resistance is Low” was chosen Top 10 Editor’s choice and Top 10 MP3 Downloads in All About Jazz. 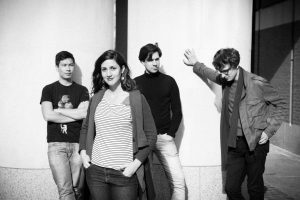 Lorena del Mar Quartet performed in Toulouse in the 30th anniversary of Jazz sur son 31.